This instrument was commissioned by Dave Dekker. A week after receiving it, Dave had this to say: "I am having a ball with this thing. I haven't even picked up my guitar since I got it." This is not actually a Mandonator™. 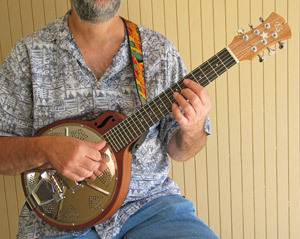 It's a resonator instrument with 6 strings, tuned as if a standard guitar had a capo on the 5th fret. From low to high, this is: A, D, G, C, E, A. I call it a Requintonator™. For additional information and sound samples, see the Requintonator™ introduction. Notice how the tung oil based varnish results in a mellower appearance than a glossy lacquer finish (compare to Mandonator™ #7, for example). This photo shows a Requintonator™ (left) next to a Mandonator™, to give an idea of the difference in size. 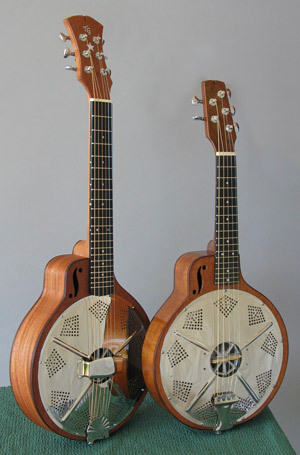 The bodies are the same; only the number of strings, and the neck and scale length are different. You can see photos of this instrument under construction on its Shop Talk page.